They’re recruiting high school students in Los Angeles, preparing speeches for University leadership, and running programming around the country—and that’s just their first month on the job. 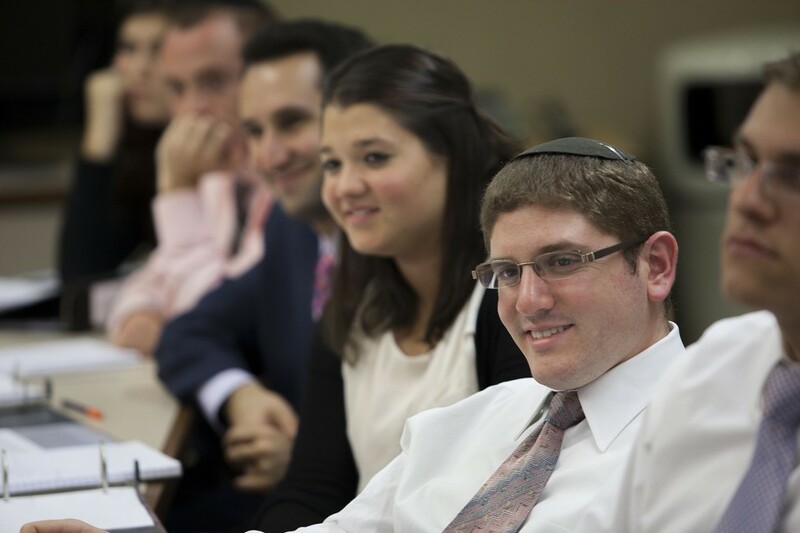 The 2012-13 cohort of Yeshiva University’s Presidential Fellowship in University and Community Leadership are rolling up their sleeves and getting down to business. 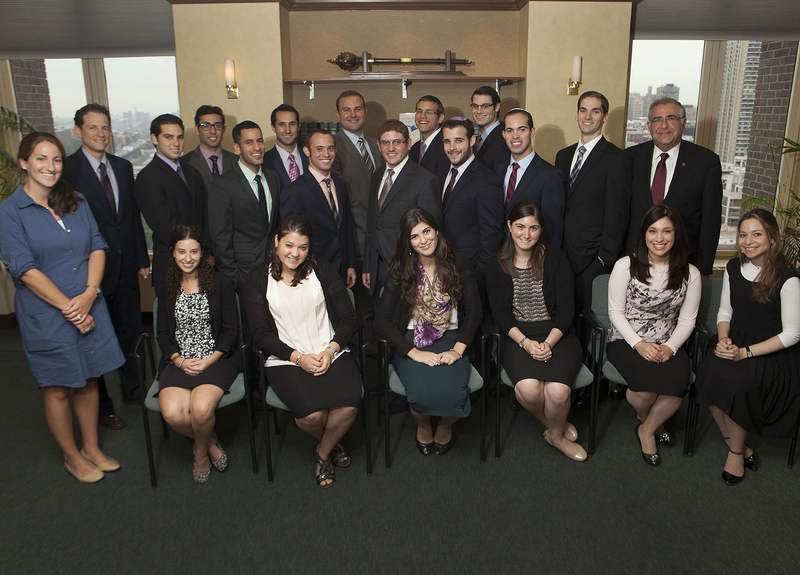 The highly competitive program selects top graduates to spend 11 months working in departments across the institution. Fellows are mentored by senior staff and work on projects integral to the University while honing their professional skills in weekly graduate seminars with leaders from many backgrounds, including philanthropists Michael Steinhardt and Ronald Stanton, author A.J. Jacobs and human rights activist Brooke Goldstein. Fellows will gain an even more nuanced understanding of Jewish communal life this year. 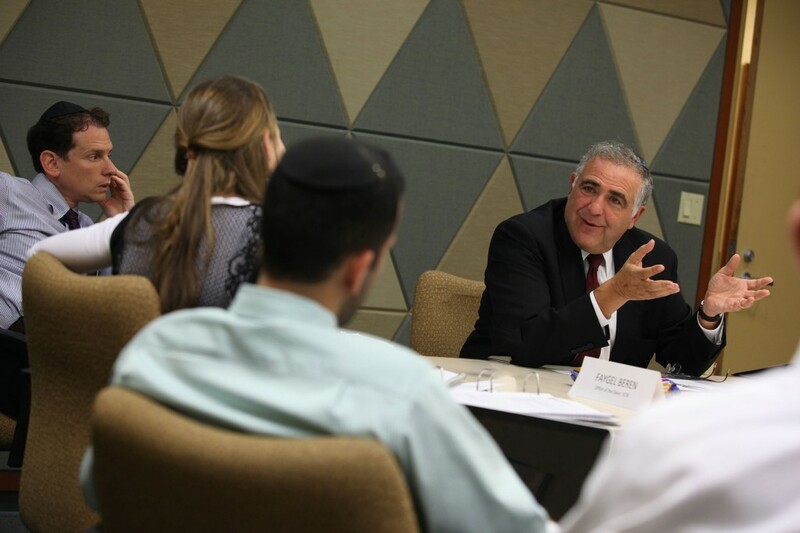 In addition to mentors within the University, each fellow has been paired with a community leader who will offer guidance based on his or her experiences in the larger Jewish and professional worlds. This new mentorship program—the brainchild of lay leader and mentor Rick Guttman—had its official launch at the 2012 ChampionsGate Leadership conference in Orlando. President Joel, right, speaks to the fellows at a weekly graduate leadership seminar. Rabbi Joseph, left, oversees the program. Since it was established by President Richard M. Joel in 2004, the fellowship has played a critical role in transforming the University into a leadership laboratory. Under the guidance of Rabbi Joseph, fellows develop thoughtful and innovative projects which they are able to drive from conception to fruition. They also partake in conferences and retreats focused on expanding their knowledge and appreciation of the larger Jewish community. This year’s Presidential Fellows are Faygel Beren, Daniel Elefant, Joshua Gottesman, Aaron Greenstein, Elana Honick, Noah Jacobson, Moshe Peters, Mordy Prus, Racheli Ratner Taubes, Tamar Schwarzbard, Dena Shayne, Binyamin Smith, Adam Tepler, Naomi Teplitsky, Ethan Wasserman, Mordy Weinstein, Anosh Zaghi and Joshua Zimmerman. Racheli Ratner Taubes, of Brooklyn, New York, hopes her fellowship in YU’s Institute for University-School Partnership will provide her with unique insight into the world of Jewish education. “I plan on teaching in a Jewish day school or yeshiva next year, and I think it is important and will be beneficial for me to gain skills and knowledge about Jewish education from a different perspective before I embark on my teaching career,” she said. Joshua Gottesman, of Beachwood, Ohio, graduated from Yeshiva College with a degree in political science and is working in the Office of the General Counsel. His responsibilities include everything from reviewing and proofreading legal documents to helping his mentor Andrew Lauer, YU’s vice president of legal affairs, secretary and general counsel, prepare the graduate course he teaches at the Sy Syms School of Business. I just want to mention I am just newbie to weblog and seriously liked this web-site. Probably I’m going to bookmark your blog post . You certainly have terrific article content. Thanks a lot for sharing with us your website page. I simply want to say I am newbie to blogging and certainly liked this web-site. Most likely I’m planning to bookmark your blog . You absolutely come with awesome writings. Cheers for sharing with us your website page. I just want to say I’m all new to blogs and actually liked this page. Most likely I’m likely to bookmark your site . You amazingly come with outstanding well written articles. Thanks for sharing with us your web-site. I simply want to say I’m new to blogs and definitely liked this website. Probably I’m want to bookmark your site . You surely come with beneficial articles and reviews. Thanks a lot for revealing your web page. I simply want to tell you that I’m newbie to blogging and honestly liked this blog. Probably I’m planning to bookmark your blog post . You amazingly have terrific stories. Kudos for sharing with us your webpage. I simply want to mention I am all new to blogging and honestly liked this website. Most likely I’m likely to bookmark your site . You absolutely have terrific articles. Cheers for sharing your website. I just want to mention I am just all new to blogging and actually liked your web blog. Almost certainly I’m planning to bookmark your blog post . You definitely come with great posts. Cheers for sharing with us your web page. I simply want to say I’m new to blogging and site-building and definitely liked your website. Almost certainly I’m want to bookmark your website . You absolutely have amazing articles and reviews. Bless you for sharing with us your webpage. I simply want to say I’m new to blogging and seriously loved this website. More than likely I’m likely to bookmark your site . You actually have amazing articles. Thanks for sharing your website. I just want to say I’m very new to blogs and certainly savored your blog. Likely I’m want to bookmark your site . You really come with perfect writings. Thanks a lot for sharing with us your webpage. I simply want to tell you that I am just beginner to blogs and seriously liked your page. Likely I’m planning to bookmark your blog post . You actually have really good well written articles. Regards for sharing your blog site. I simply want to tell you that I am just beginner to blogging and site-building and really loved your web site. Likely I’m want to bookmark your blog post . You surely have outstanding articles. Appreciate it for sharing your web site. I just want to say I am all new to blogging and site-building and definitely savored your web blog. Probably I’m want to bookmark your blog post . You definitely come with amazing articles. With thanks for sharing with us your website page. I just want to say I am just all new to blogging and site-building and certainly savored you’re web page. Most likely I’m likely to bookmark your blog . You amazingly come with terrific article content. Many thanks for sharing your website page. I simply want to tell you that I am just all new to blogging and site-building and truly loved this website. Likely I’m likely to bookmark your website . You surely come with outstanding articles. Many thanks for sharing with us your web page. I just want to mention I am just newbie to blogs and truly loved you’re web page. More than likely I’m want to bookmark your site . You amazingly come with impressive writings. With thanks for sharing your website. I just want to say I am just new to blogging and absolutely loved you’re website. Most likely I’m likely to bookmark your blog post . You really come with perfect writings. Thanks a bunch for sharing with us your website. I just want to say I’m beginner to blogging and site-building and certainly liked this web page. Very likely I’m planning to bookmark your site . You absolutely have wonderful stories. Bless you for sharing with us your blog. I simply want to mention I am very new to blogs and truly savored you’re blog site. Most likely I’m want to bookmark your website . You really have great articles. Appreciate it for sharing with us your website. I just want to say I’m very new to blogging and honestly enjoyed this web-site. Likely I’m going to bookmark your blog . You absolutely come with perfect writings. With thanks for sharing with us your website.